OPPOSITION in residence, the phrase used by the Facebooker* above to describe Dr Mahathir & The Rebels after this morning's press conference, reminds me of The Resident Evil. This science fiction action-horror series has seen five parts en route to the ultimate, The Resident Evil: Final Chapter, set for release Jan 2017. Like the movie, Dr M has starred in a series of upheavals and crises. 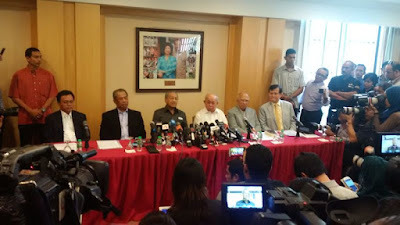 Their latest alliance, forged formally during a hastily organised Press conference in Putrajaya at 10 this morning after months of, can be seen as a preview to Mahathir's Final Chapter. How will this chapter end? Your guess is as good as mine. But one good thing did come out of this morning's Press conference, and that is both Muhyiddin Yassin and Shafie Afdal, dropped by Najib Razak in his last Cabinet reshuffle, have finally, after months of quiet suffering, come out in the open to oppose their former boss. Najib himself told an aide this afternoon that he saw today's event at the Perdana Leadership Foundation as a blessing in disguise. For the first time Muhyiddin and Shafie Afdal (deputy president and vice president of UMNO, respectively) have officially broken ranks with the President. At least they are not hiding anymore, we know now who they're for and where they stand, he told the aide. And that knowledge, Najib was said to have added, will guide him to do what we need to needs do next. Zakhir Mohamad's latest posting Political-Economic Terrorists ll. Yayyy yayyyy for zakhir, bujai, a voice and you. Finally four of you also have shown your true colours. "For the first time Muhyiddin and Shafie Afdal (deputy president and vice president of UMNO, respectively) have officially broken ranks with the President. At least they are not hiding anymore, we know now who they're for and where they stand, he told the aide." They stand with the rakyat. On the other side, some mercenary KBU, cronies and prepaid bloggers. Not to mention the Minister Of Blogging from Sabah, who seems to know nothing else but polishing. I think I admire these two gentlemen a lot more than those so in love with $$$$ that they will sell out. Perhaps you can explain why your Bugis god has just liwatted the Malaysian public yet again? "...the gradual reduction of intra-city tolls". You see, the word "reduction" means GO DOWN, not GO UP. How many flip-flops has this pink-lipped conman pulled, bro? instead of the four horsemen who fashions themselves to be ex journalist why dont they name themselve the four blongang? ex journalists who thinks so highly of themselves with a delusion of grandeur!!! Shafie, Abang Din, Dr M, Ku Li, Sanusi, Ong Tee Keat. Mat Maslan IQ 3.85, Aziz Krapawi, Sabah Asslicker 1, The Donation King Himself, Tajuddin, Sabah Asslicker 2, Komedi, Ali Gostan, Jamal Ikan Ganja, Annuar Mara, and many other "loyal but not smart" luminaries. No wonder the Malaysia of the 1990s was a far better place than the mess we have today. "Umno deputy president Muhyiddin Yassin made all BN MPs vote for the Security Offences (Special Measures) Act (Sosma) when he was BN whip, BN strategic communications director Abdul Rahman Dahlan said." How is that a licence to abuse a terrorism law? Abdul Rahman Dahlan needs to read the Penal Code s124. The Penal Code itself defines what "SABOTAGE" in the context of s.124 means. Hence it is utterly clear that s.124 is completely inapplicable here. Why would you apply SOSMA when no offence has been committed? 3. The RI is to be headed by someone senior in the ruling party. Since he has been asking questions and looking for answers, I would humbly propose Tan Sri Hj Muhyiddin Mohd Yassin to lead. 7. Have a deadline — Investigations started sometime in March/April 2015 and as we are aware BNM and MACC have given their findings to the AG. It is long overdue and the AG has to decide and report to the RI on the next course of action. As stated in the Ruler’s statement, if this issue is allowed to drag on, it could jeopardise the country’s economy and the livelihood of the people. Arul needs to start booking an escape. eh eh.. oh oh.. ewah ewah.. This sounds exactly the crime that the Prime Minister must be sizing up to throw at the world renowned and respected Head of Malaysia’s Central Bank, who like Mr Khairuddin has made absolutely clear that she is deeply concerned at what she believes has been grand criminal behaviour at the 1MDB fund, managed by Najib. She, like Khairuddin, has made clear she is concerned that rightful prosecutions on evidence produced by her bank have been suppressed by the Prime Minister’s new puppet AG. The Prime Minister seems very happy to blame everyone else for ‘sabotaging’ the economy, purely for pointing out that he has been looting it. Does Malaysia wish to become a failed state or to get rid of a failed Prime Minister? Wow!, you are privy to Datuk Seri Najib's private conversations. Resident evil are those thieves in 1MDB and the lackeys that supported the them. As the creatures in Resident evil they should be burn on stakes.